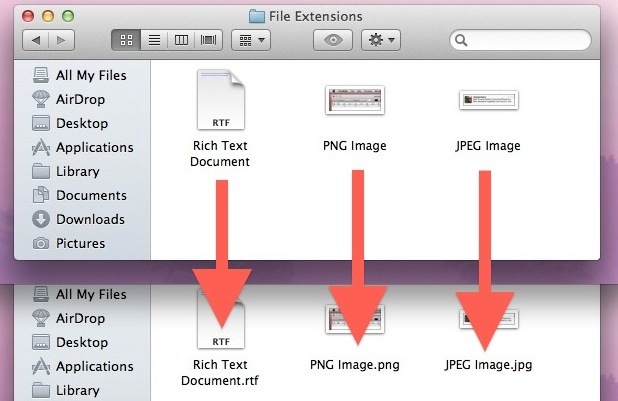 File extensions (like .jpg, .txt, .pdf, etc) make it easy to see what a specific file type format is, but as many Mac users notice, those file extensions are hidden by default in Mac OS X. 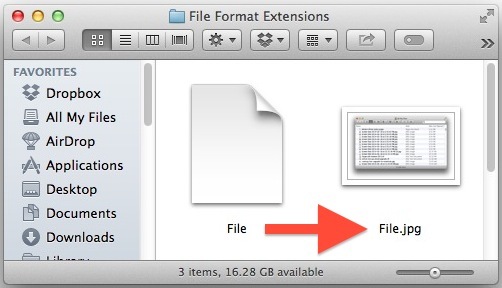 While hiding the format suffix makes for a cleaner user experience and is fine for many users, it can be frustrating if you’d rather know instantly what file format type a file is just by looking at the name, and for many power users it’s one of the first things changed when setting up a Mac. As we’ll demonstrate, OS X offers two choices for displaying file format extensions after file names: You can either set all extensions to be displayed for every file in Finder through a universal setting, or you can set extensions to be shown on a per file basis with the help of the Get Info command. For either choice, the file format type will be shown as part of the file name, changing something like “File” to display as “File.txt”. 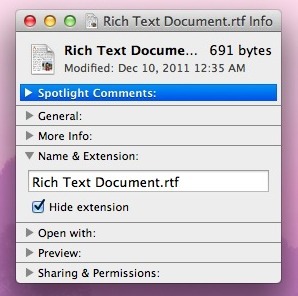 The setting to reveal filename extensions should be immediate, though some versions of OS X have a slight delay for revealing the extensions on visible files. This can be expedited by simply toggling the setting again to immediately display them (this is shown in the video below). The setting is in all versions of OS X, it does not matter what is running on the Mac. To hide the filename extensions you simply need to keep the setting toggled off. You can also selectively show and hide filename extensions on a per file basis. If you’d rather not see them all, or if you want to hide some and show others, you can also show (or hide) file extensions on a per file basis. For many users, not seeing filename extensions is probably fine, but I often set custom file associations, and knowing the extension will let you know what app is going to open with each file without looking at the “Open With” menu to be certain. Showing file extensions is useful for files with different formats saved with the same name, for example, I may have an “order peanuts” text file, and an “order peanuts” JPG file. Since I exclusively use column view, it is hard to distinguish the file format based on the small icons. To keep the display names short I prefer to set show extension only for individual files. This is one of those ‘must do’ changes as soon as you boot a new Mac. That and dragging half the garbage out of the Dock. The Finder setting to hide extensions is hit and miss – it works for some files but not others. It definitely doesn’t work with MS Office 2008/2011 files – their extensions show all the time. Adobe PDFs sometimes show, sometimes not. Files created by Apple applications seem to be the most consistent, so I suspect its a third-party adherence to Apple software and/or GUI guidelines that determine if extensions show or not..
having said that, I am at the other end of the spectrum – I NEVER want to see extensions, and wish there was some universal Terminal command to banish them forever. Exactly. Hidden extensions are so annoying. It’s one of the first settings I change. In this connected age, showing file extensions is a must. There ARE files that could infect even a Mac, and extensions are one quick way to know what a file is without clicking on it. Thanks for posting this. Changing this setting is just as much a must in Mac as it is in Windows. Showing extensions is definitely a must for professionals. Again, thanks! This does not work for me with Mavericks and Finder. I do a FIND for files with “a” in the name and extension equal to “app”. 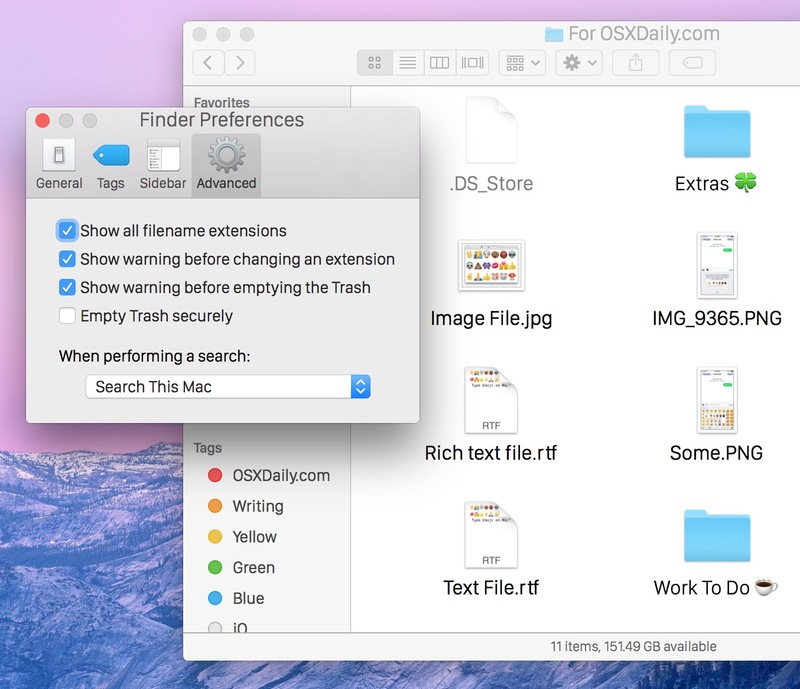 Even though Finder preferences is set to show all extensions only a few extensions show. Doing a CMD+I to display Info shows a checkmark in Hide Extension and I am unable to change it. In Info it does show the extension, .app, but does not allow removing the checkmark next to Hide Extension – as far as I can tell. Please let me know if there is a way.